وَبِصَوْمِ غَدٍ نَّوَيْتُ مِنْ شَهْرِ رَمَضَانَ. O my Allah, for Thee, I fast, and with the food, Thou gives me I break the fast, and I rely on Thee. 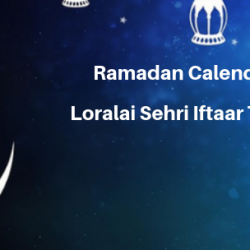 This is a complete schedule and timings of Sehri and Iftar in Sukkur for 2019, You can find the Sehri and iftar timings in Sukkur according to date and timings here. You can find the Sehri time today in Sukkur here with it's all prayer (Namaz) timings. You can also find the Dua for Sehri and Iftaar here for Sukkur, Pakistan. Ramadan Calendar for Sukkur 2019 is based on Shia and Sunni time table. This is a complete Ramadan Calendar 2019 Sukkur for both Fiqah Hanafi and Fiqah Jafariya along with their prayer timings of Fajr, Zuhr, Asr, Isha and Maghrib, you can also find the Sunrise and Sunset timings of Sukkur during Ramadan 2019.